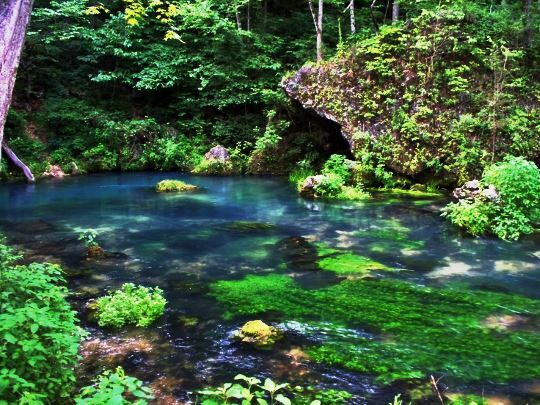 The spring is located close to Pulltite campground, about 14 miles north of Eminence off of highway EE. The Spring branch carries a daily flow of 38 million gallons from Pulltite Spring into the Current River. The spring flows from the rock structures at the bottom of a cliff forming a small pool. Pulltite Spring gained its name from the “tight pull” of the horse drawn teams down a steep hill next to the mills that were positioned on the spring-branch. The spring was purchased by St Louis businessmen in 1911 and was run as a fishing resort, until the area was acquired by the National Park Service in 1967. Across the river from the campground, next to Pulltite Spring, is Pulltite Cabin. The only way to see the cabin is by use of a boat or by wading across the river. It was built as a vacation lodge by the six man “Pulltight Corporation,” which was created to develop the cabin into a retreat facility. 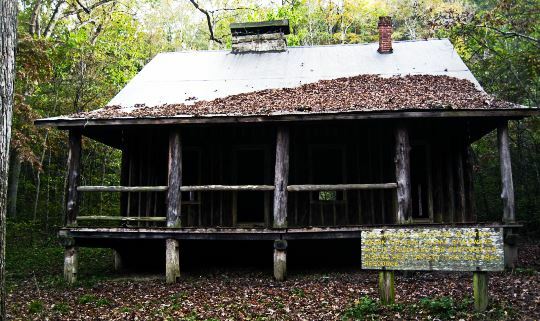 The cabin was completed on the day before Thanksgiving in 1913 and is open for your exploration. The National Park Service hopes to restore it to its former beauty.